Washington, D.C., 27 October 2004 - The recent passing of Paul Nitze at the age of 97 has brought forth the expected array of obituaries, retrospectives and assessments of his lengthy and often controversial career, in the process turning people's minds back to an era when superpower rivalry and the threat of nuclear annihilation hung over the world as the United States and Russia engaged in what John F. Kennedy termed the long, twilight struggle. As the many obituaries that have appeared since his death detail, Nitze's life in public service, following a successful early career as a Wall Street financier, placed him at the center of practically every significant decision or debate about U.S. Cold War strategy and nuclear weapons policies, though not always at the highest levels. As his memoir, titled From Hiroshima to Glasnost, underscores, this career stretched from his work with the World War II Strategic Bombing Survey, which placed him in Hiroshima and Nagasaki soon after the atomic bombs were dropped, to his negotiations with the Soviets on intermediate nuclear forces under Reagan. His commitment to rigorous analysis and advocacy of what he saw as the logical consequences of this analysis in strategic planning and arms control negotiations often put him at odds with colleagues as well as his adversaries and critics, who saw his assessments as biased towards worst-case scenarios. Both Nitze's memoir and his biographers have detailed the history of his often contentious battles, inside and outside of government, whenever he believed that U.S. was pursuing ill-advised and even dangerous policies with respect to fielding the necessary levels and proper mix of military forces both conventional and nuclear, and pursuing arms control agreements with the USSR. For Nitze, the emphasis upon the need for dispassionate, objective analysis of nuclear weapons capabilities and the development of both military plans and diplomatic policies built upon these analyses would be the constant motif of his thinking on these issues. To this end, Nitze became the undisputed master of his game, with a grasp of the technological and operational aspects of nuclear planning. For some, this might be seen as the logical next step in the development of U.S. deterrence policy, once his predecessor George Kennan had established the political and economic thrusts of America's postwar response to the Soviet threat. As historian Gregg Herken, author of The Winning Weapon and Counsels of War, puts it, "while George Kennan laid out the grand strategy for containment, it was Paul Nitze who determined how that strategy would be carried out--by containing the Soviet Union with the threat of nuclear weapons." For Kennan, however, Nitze was guilty of a severe distortion and misapplication of the policy he had outlined, and the diplomat denounced Nitze for "militarizing" containment. As Fred Kaplan, author of The Wizards of Armageddon, notes in his Slate obituary on Nitze (Note 3), Nitze's legacy can be viewed as providing the intellectual and policy basis for the rise of America as a global superpower after World War II, a status that was founded primarily upon America's nuclear might, which created nightmarish dilemmas for the country's leaders and its people. Kaplan cites documents with which Nitze is closely tied that illustrate his central role in defining the Cold War's strategic dilemmas and laying out the logical (in his view) solutions to these dilemmas. Only one of these, NSC 68, is easily available online. (Note 4) In order to provide an inside look at Nitze's career and the range of events and issues with which he was engaged, the National Security Archive is posting on the Web a selection of other declassified documents dating from his time as head of the Policy Planning Staff under Truman to his work for Reagan on arms control matters. (Note 5) As the document descriptions below detail, Nitze's involvement in nuclear weapons policies included delicate questions of U.S. obligations to consult with allies before the use of nuclear weapons, his role in drafting the Gaither Report that criticized Eisenhower's military policies and made the case for an emerging "missile gap" with the Soviet Union, his discussions with NATO allies on military planning to defend West Berlin against a Soviet attack, his participation in the SALT I negotiations, his central role in spearheading criticism of the arms control policies of Ford and Carter, and his position as negotiator, presidential advisor and "éminence grise" on arms control issues during the Reagan administration. All in all, it is a remarkable record of determined and unflagging engagement publicly and behind the closed doors of government with the key problem of the Cold War era: how to respond rationally to the fact of nuclear weapons without giving in to either despair or unfounded optimism about the security dilemmas they created. The wisdom of his responses and the impact they had upon U.S. and Cold War history are issues that will likely be the focus of historical study and debate for some time, as the records of the era are opened to scrutiny. During most of Truman's second term, Nitze served as director of the State Department's Policy Planning Staff, taking over from his predecessor, George F. Kennan. At PPS, Nitze had a range of duties, some of which included producing major strategic assessments that followed up on NSC 68. As indicated by this document, he also worked on nuclear weapons policy issues. During this meeting, he and top U.S. officials met with their British counterparts to discuss one of the most sensitive alliance issues, the problem of nuclear weapons use. With East-West tensions worsening largely because of the Korean situation, the British, as now a close ally, worried that the United States would precipitately use nuclear weapons against North Korea or China. While top British officials sought assurances that Washington would consult London before making a nuclear use decision, Nitze and his colleagues were unwilling to make any commitments in advance. Out of government during the Eisenhower administration, Nitze remained active in foreign affairs issues through his involvement in the Council on Foreign Relations and the School for Advanced International Studies (SAIS), which he had helped found, among other activities. He emerged as a sharp critic of Eisenhower's tight military budget policies. This document, generally known as the Gaither Report--after H. Rowland Gaither, the chairman of the Security Resources Panel--played an important role in raising concerns about an alleged missile gap and mobilizing support for a U.S. ICBM buildup, during Eisenhower's second term. While not a senior member of the Gaither panel, Paul Nitze played a key role in drafting the report and, as Fred Kaplan recently suggested, it, like NSC 68, was "another barn-burner." President Eisenhower discounted the report but the substance leaked to the press and initiated considerable agitation in Congress and elsewhere about the U.S. strategic position and calls for higher levels of military spending. In the wake of a note on the Berlin question, which the Soviet Union sent the Western powers in November 1958, the United States and its closest European allies wondered whether Soviet premier Nikita Khrushchev would initiate a major crisis over the status of West Berlin. In this speech, Nitze reviews the post-World War II debates over the future of Germany, including George Kennan's "Plan A," assesses Soviet intentions, and mulls over the political and military options available to the Allies in the event of a military crisis. Nitze believed that the situation was serious and in early 1959 saw "little prospect of weaving through the next twelve months without war and without the surrender of Berlin, unless we combine firmness with great discretion." While supporting a firm stand, Nitze saw a great risk of nuclear weapons use, which he believed had to be "avoided at all costs." An early supporter of John F. Kennedy's presidential campaign, Nitze was offered several job possibilities after the election. One was assistant to the president for national security affairs; the other was assistant secretary of defense for international security affairs. Not realizing how important the White House job could be, Nitze instead chose the position at ISA, then called the "little State Department" because of its many diplomatic responsibilities (overseas base agreements, military assistance, etc.). With another Berlin crisis unfolding, Nitze became especially heavily involved in European defense issues. This memorandum, prepared by State Department official Seymour Weiss, reviews the wide range of issues that Nitze and the Pentagon covered during recent defense talks in France and Germany. Issues included planning by the British Army on the Rhine (BAOR), plans for the deployment of medium range ballistic missiles (MRBMs), military plans by NATO's Allied Command Europe (ACE), discussions with the British on the Skybolt air-to-surface missile, the recent NATO meeting in Paris, and a controversy with West German defense minister Strauss over U.S. nuclear weapons-sharing arrangements for West German fighter jets, such as the 104G. A recurring issue was control over nuclear weapons. The discussion concluded with a review of discussions with Supreme Allied Commander Europe General Lauris Norstad over military planning for a Berlin crisis. One of the original planning documents was called the "Horse Blanket" because its many contingencies and options were described on a very large piece of paper. The scaled-down version, with fewer options, on a smaller piece of paper was called "Poodle Blanket." In his role as Assistant Secretary of Defense for International Security Affairs Nitze chaired the Military Subgroup of the Washington Ambassadorial Group representing the three occupying Western powers in West Berlin, the U.S., the United Kingdom, and France, but also West Germany (because of its direct interest in the Berlin problem). During the summer of 1962, amidst growing concern about the possibility that East-West tensions might worsen, Nitze's committee looked closely at military plans. Here they reviewed a British paper on the phases of Berlin military operations, a possible role for nuclear weapons use, such a "demonstration" shot, in a conflict; and the possibility of limited war at sea. While the Germans were interested in plans for selective use of nuclear weapons, Nitze was especially concerned about the danger of a preemptive war and uncontrolled nuclear use. In this interview with Alfred Goldberg (who later became chief historian, Office of Secretary of Defense), Nitze focuses on his role in strategic bombardment issues, beginning with World War II, especially his thinking during the late 1950s and early 1960s about the possibility of a counterforce nuclear strategy. In the last years of the Johnson administration, Nitze rose to the post of Deputy Secretary of Defense, which post he left when Nixon came to power. Recognizing Nitze's influence and expertise, when the new administration assembled a delegation for the Strategic Arms Limitation Talks (SALT), it kept him on its side by bringing him into the SALT negotiations as a representative of the Defense Department. At the head of the delegation was Gerard C. Smith, who played a dual role as director of the Arms Control and Disarmament Agency. Soon after the preliminary talks began at Helsinki, Nitze joined other delegates in sending "thinkpieces" assessing areas where U.S. and Soviet interests converged and diverged, possible scope of an agreement, and Soviet negotiating tactics. As part of the permanent State Department bureaucracy, Seymour Weiss had developed his own sources of information at the Pentagon and, of course, had worked with Nitze in the past (see document 4). Here Nitze and Gardiner Tucker, the recently-appointed Assistant Secretary of Defense for Systems Analysis, review a number of SALT issues, including the form of a possible agreement, proposals to ban multiple independently- targetable re-entry vehicles (MIRVs), and the status of anti-ballistic missiles, among other problems. Of particular interest is the discussion of a proposed ban on testing MIRVs, which Nitze and Tucker rejected, and the differences between Nitze and Tucker over an ABM agreement, with Nitze and Tucker debating the merits of an agreement on minimum, even "zero," deployment. While Henry Kissinger would later regret publicly that the United States had not sought a MIRV ban, it is evident that Nitze and Tucker were among those at the Pentagon who were reluctant to see any restrictions on U.S. freedom of action to deploy MIRVs. On ABM deployments, however, Nitze was less of a hard-liner on an agreement to limit them sharply. Here Nitze provides a blow-by-blow and often amusing account of the frenzied activity, on the eve of the Moscow summit between Nixon and Brezhnev, which produced the final SALT agreements on the brink of the signing ceremony in the Kremlin. While Smith, Nitze and other members of the SALT team had played a key role in negotiating the agreements, they got "no respect" after arriving in Moscow to complete the paperwork and attend the signing. The Nixon White House, which had little interest in sharing credit with the negotiators, had even less interest in their care and feeding; in Nitze's account negotiators were left to fend for themselves in sometimes bizarre circumstances. In the last few years of Kissinger's tenure in government, Nixon/Ford détente policies experienced strong criticism from Republicans on the right, led by Ronald Reagan, as well as from some liberal democrats and former socialists. Some of these tendencies began to crystallize into what later became known as "neo-conservatism." Reflecting the failure or the inability of the Ford administration to build a national consensus in favor of détente, critics of détente in and out of government began to take on the National Intelligence Estimates, arguing that they consistently underestimated the severity of the Soviet military threat to the United States. Conservatives on the President's Foreign Intelligence Advisory Board (PFIAB) asked DCI George H.W. Bush to establish a special panel to assess the NIEs and develop an alternative analysis. Headed by Harvard Sovietologist Richard Pipes, the Team B panel included Paul Nitze, who played an active part. Other participants were Seymour Weiss and Paul Wolfowitz. Given Team B's ominous assumptions about Soviet intentions and capabilities, Raymond Garthoff later argued, "it [was] not surprising that it came up with more ominous findings." After Ford and Kissinger left office Nitze continued to play a role as a critic by helping to establish the Committee for the Present Danger, which brought together "neo-cons" and Republican conservatives, a number of whom would work for the Reagan administration four years later. For his contribution to the arms control diplomacy of the Reagan administration, Nitze was best known for his famous "walk in the woods" that led to the agreement with the Soviets on Intermediate Range Nuclear Forces (INF). So far the record of that episode remains classified, but documents on other aspects of Nitze's official role during the Reagan years have been released. A central issue was the Strategic Defense Initiative (SDI) program and the ways and means to reconcile it with the Anti-Ballistic Missile Treaty, which Nitze had helped negotiate. These documents show some of the internal conflicts in the Reagan administration over the interpretation over the ABM Treaty, for example, "Agreed Statement D" which required consultations if either of the signatories sought to deploy systems using "other physical principles"-such as futuristic laser weapons-than those currently in use. In his memorandum, Platt mentioned Nitze as supporting the State Department's view that the Pentagon's interpretation of the statement was "misleading" and that a decision to reinterpret it "would be viewed as a cynical effort to change the rules mid-game." In the other memorandum, Nitze recounts his and Secretary Shultz's discussions with Soviet diplomats on space weapons (including ASAT/anti-satellite weapons, ABM treaty interpretations, and a ban on ship-launched cruise missiles (SLCMs). 1. It is an interesting comment on Nitze's sense of priorities that after leaving government service, and the end of the Cold War, Nitze turned his attention to environmental problems as the issue most pressing and worthy of his time and energies. 2. Strobe Talbott, The Master of the Game: Paul Nitze and the Nuclear Peace (Alfred A. Knopf, New York, 1988), pp. 14-15. Another biography of Nitze is David Callahan, Dangerous Capabilities: Paul Nitze and the Cold War (Harper & Row, New York, 1990). Also essential is Nitze's autobiography, From Hiroshima to Glasnost: At the Center of Decision - A Memoir (with Ann M. Smith and Steven L. Rearden) (Grove Weidenfeld, New York, 1989). 3. Fred Kaplan, "Paul Nitze: The man who brought us the Cold War," Slate, October 21, 2004, available at <http://slate.msn.com/id/2108510/>. 4. The text of NSC 68, perhaps the key and defining statement of U.S. 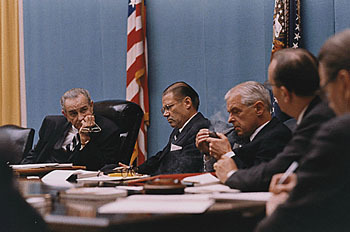 Cold War strategy, can be found on the Federation of American Scientists website, at <http://www.fas.org/irp/offdocs/nsc-hst/nsc-68.htm>. 5. In addition to these documents, the reader should consult these sources for additional documents bearing on Nitze's role in Cold War policy-making: The Foreign Relations of the United States series, published by the Department of State, especially those dealing with national security policy or arms control, for the Truman administrations and later; and The Presidential Recordings - John F. Kennedy: The Great Crises (3 volumes), general editors Philip Zelikow and Ernest May (W.W. Norton & Company, New York, 2001), in particular volumes 2 and 3, which cover the Cuban Missile Crisis, in which Nitze played a key role as a member of the Executive Committee established by Kennedy to decide the U.S. response to the Soviet deployment of nuclear-capable missiles to Cuba.